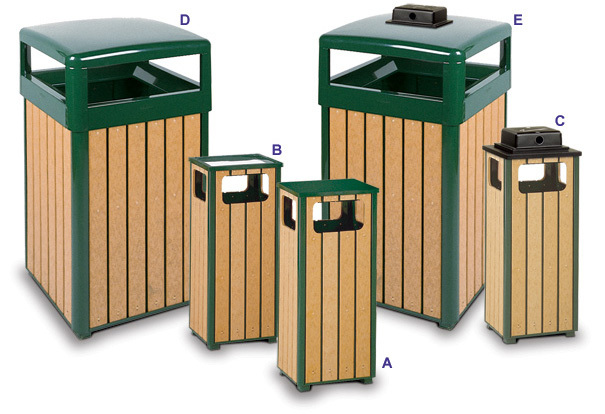 Built to withstand the elements, these waste receptacles are made with heavy gauge fire safe steel and 100% post consumer recycled polyethylene construction. The recycled plastic lumber slats are cedar finish with empire green UV stabilized powder-coated finish galvanized steel trim. Four way disposal openings allow for waste to be discarded form all directions. Lift-off top allows easy access and emptying of rigid plastic liner. Ships fully assembled. Models available with protective weather shield ash urn. Rigid plastic liner is included with all of these receptacles.